Nashville is hot, and we don’t just mean the chicken. With each passing year, more-and-more people are falling in love with Music City. 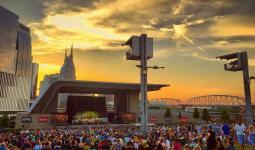 During the summer months, locals and tourists alike rock out at this downtown amphitheater, which hosts gigantic names from all musical genres.